They're 100% handmade in Mexico, in the regions of Chiapas and Oaxaca. We love to share our love for pompoms because we believe they have the power to change the world through their vibrant colors and feel. We believe pompoms will make anyone happier. They carry a magical energy, which we are convinced comes from the beautiful people that produce them in Chiapas, Mexico. These pompoms great physical representation of the belief that we’re all interconnected, and when tied it into a full circle, how we’re all one. Lucia is Ubuntu's main pompom producer and an absolutely queen of life. She's 21 years old, lives in the mountains of San Juan Chamula, in Chiapas, Mexico. She's Samuel's wife and mother of two kids. 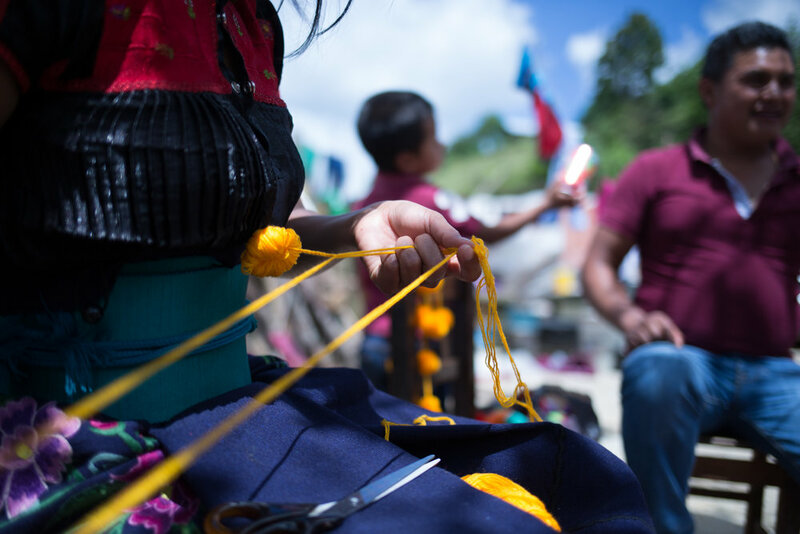 We met her last June in her home in Chiapas, and we were very lucky to witness the magic that goes behind making a pompom necklace. Each pompom necklace takes from 3-4 hours of continuous hand work. Lucia describes it as a very peaceful moment. Everyone gives pompoms different meanings. What we they share in common that they're meant to be shared, to be gifted. If you are gifted a pair of pompoms, you'll probably want to do the same for someone else. If you haven't gifted a pair to someone, try it, probably guaranteed you will love how much joy it'll bring to the person you're gifting them. Some people don’t wear them at all — they're great to just be left as decoration, pretty much anywhere. Some people even use them as the coolest dog leash.